A step in the right direction for any society is reinforcing and fortifying the family structure. 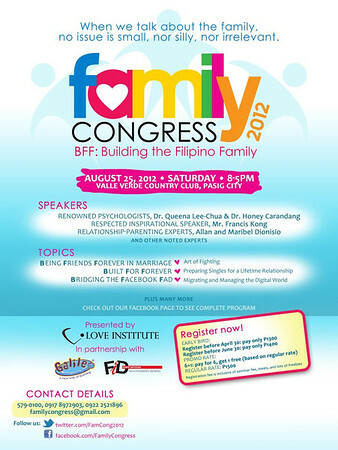 With the unique problems we are facing now, like the youth culture that shies away from responsibility and the gadgets creating distractions from actual communication and time together, the upcoming Family Congress 2012 is not just timely but necessary. Experts in various fields are coming together for this event to tackle the following issues while attendees can choose which session they want to attend for the morning and afternoon. 1A Migrating and Managing the Digital World by Queena Lee-Chua, Ph.D.
2A Handling the Bully and the Bullied by Honey Carandang, Ph.D.
5A From Wellness to Wholeness (for adults 21 & up) by Harriet Hormillosa, M.A. 6P Being Friends Forever in Marriage: Learning the Art of Fighting by Allan Dionisio, M.D. & Maribel Dionisio, M.A. Aside from attending two sessions, guests will also get to hear inspirational messages from Archbishop Luis Antonio Tagle and motivational speaker Francis Kong. Early bird rate is P1400 if you register before June 30. Regular rate is P1500 per attendee. Promo rate: 6+1 (pay for 6, get 1 free based on regular rate). Registration fee is inclusive of seminar fee, meals, and lots of freebies. For more information, you can call 579-0100, 0917-8972903, 0922-2521896, email familycongress@gmail.com, follow them on twitter.com/FamCong2012 and like facebook.com/FamilyCongress.